Back from my so called hiatus…. I know how boring it gets for you all, to hear excuses from me about my frequent disappearing acts.Won’t drag this too long, but will surely say… Life gets busy, so much that there comes a time when we are bound to concentrate more on our responsibilities than ourselves.The cry for paying attention to our duties is impossible to give a miss, and no matter how impatient or restless our mind gets , we can’t help but ignore it’s need for pursuing our hobbies or passion.Ditto with me…No matter how much my Blog shouted for some attention and updates, I was kept occupied with many good and bad things crisscrossing the walk of my life and thats the reason for me being on and off , posting recipes at irregular intervals. So how was your life , during the period when we kinda lost touch? Had fun in my absence? Cooked something great? Met with your friends ? Roamed around some nice places? Watched some good movies? Tortured your boss or is reverse true for you? Well I am all ears for you if you have something to share. I on my part was feeling low due to bad health of my mother. Days and nights were spend worrying about her deteriorating health and visits to Hospital.It was a night mare. Though she is recovering now, but still it might take a long time, before she is back to normal life.Can’t do much about it but pray that she gets well soon. And how am I feeling Foodwise? Terrible I must say…because the time when I expected markets to be flooded with fresh green vegetables(It’s winter here..the time for bounties of vegetables) at dirt cheap price, all that I am able to find are dirt laden, wilting and dying vegetables at rocket high price. Previously it was just few selected Pulses that burnt holes in our pockets, so the meals consisted of more fruits and vegetables, rice and wheat.But now?? This used to be the time of the year when a chilling winter evening was enjoyed with piping hot tomato soup, with tomatoes being available at 4 rs/kg.And now? The underquality tomatoes with over priced tag(Whooping 40 rs/kg) keeps the thought of making soup , at bay. Rice, sugar, fruits, oil…everything is going beyond the reach of common man.At times I wonder how does our government get immune to the cries of people , calling for some control over prices of commodities.But then , can we blame them? How will the voice of a person shouting outside the Parliament reach the ears of ministers , who are deafened by the shrieks and fights of MPs inside the parliament. And that too when they are discussing some important issues like Reservations, Communalism, renaming of places, language dominance, multi crore scams, slaps and all…these surely need more pondering and discussions than the petty issues of ours like sanitation, bad roads, worse traffic, inflation, etc etc.These of course can wait ,till our honorable leaders decide upon which road and place should be renamed , which language should be spoken, which festivals should be celebrated and which shouldn’t, which leader should be bashed and which one to be rewarded, who is faking the concern shown towards poor and which leader serves people with true intention(Really?)..Phew…. Ok got off the track again (can’t help..I am fuming inside)…so dragging myself back to the Recipe of the day. The word seyal is generally referred to the way of cooking something with onions and or garlic with very little (or sometimes none) water.Today’s recipe also requires cooking all the vegetable in onion base , where the veggies get cooked in their own juices imparting a very distinct flavor, very mild yet very delicious. Pick cauliflower florets,wash thoroughly or soak in warm salted water to get rid of tiny organisms if any. Trim ends of bhindi and slit them in middle, stuff some salt and turmeric and coriander powder in each bhindi. This is to make bhindi bit spicier.You can also shallow fry bhindi separately and use it later in the curry.This is for those who don't like the slimy bhindis, or else just keep aside the stuffed bhindi for later use. Sipri (Aluminium Handi) using about two spoons of oil.If using garlic add it now. When onion turns pink in colour,add chopped tomatoes and fry. Add potato chunks,chopped green chillies, salt,turmeric powder, coriander powder, garam masala powder and fry properly. Then add cauliflower florets,drumsticks and peas and mix properly. Add very little water if mixture tends to stick the bottom of pan and let the vegetables cook further on low flame. Remember to cover the vessel with a lid and put some weight upon it to hurry up the process of cooking. When half done, add Stuffed bhindis and mix carefully as these tend to break away. Now let all the vegetables cook properly, and till all the water is evaporated.You might need to sprinkle some water now and then if mixture dries up but veggies are yet uncooked. Garnish with coriander leaves and serve with phulkas. I tried this recipe while hosting my MealTango guest and just loved it. mealtango.in is a site where you can host wonderful people from around the world and make friends over food you cook and you get appreciated as well 🙂 Thanks to sindhi rasoi for providing great recipes..
Oh! it was a delicious dish. 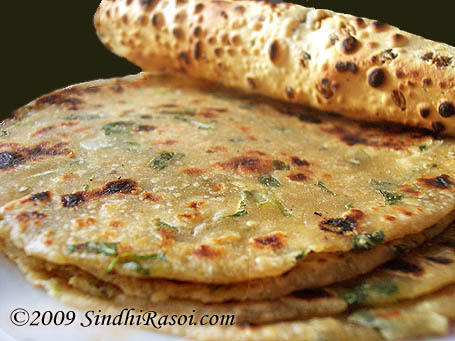 will like to know and try more & more sindhi recepies. I really like seyal bhaji & onion base vegetables. i love very much to cook and to feed my children. 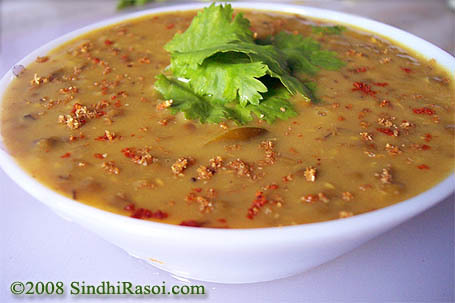 I am a cooking buff so its really great to find out sindhi recipes here. I have grown up eating this food but to actually find out more variants is interesting. Your website reminds me of the forgotton sabzis I used to have as a kid. Thanks..!! Btw, I was just reading above and you mentioned about not being able to make soup because of the rising prices of tomatoes. I wanted to share that I made this very easy veg soup this winter which was mouth-watering and was appreciated. It did not have any tomatoes in it and was very healthy. So, if you would like to know, plz tell me. I would love to share..
Take care and keep writing..
Great work!!! I jus love ur blog. Could u give me some vegetarian recipes which do not contain onion?? This is my first time posting on this blog, I am enjoying reading all the recipes here and hope to try some of them soon. Reading this blog takes me back to my childhood memories. Which in also reminds me of Sindhi Khorak which my mom used to make, unfortunately she is no more and I would love to find a recipe to make it. 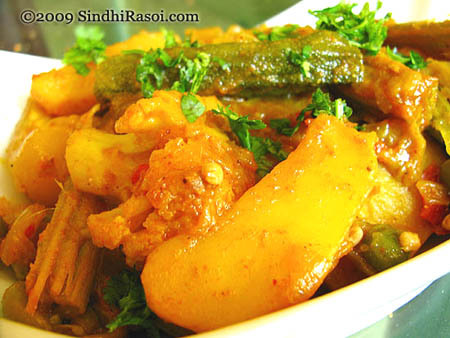 I hope you all can help me with a SIndhi Khorak recipe. 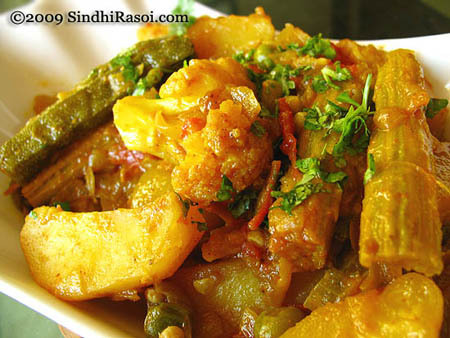 Your blog reminds me of my childhood, I miss sindhi food!!! I try and make as much sindhi stuff as I can but my husband is a pakka Hyderabadi and prefers Moghalai food. I stumbled upon you blog in my qwest for recipes and am really gald I found it. Please continue to post authentic sindhi recipes….your efforts are really appreciated…..I havent seen any non-veg recipes on your blog. Are you vegetarian? It must have been heart-wrenching to see your mom in the hospital and tiring too. But now that she is on her road to recovery you can set your worries aside. Your smiling face will help her recover faster. God bless you both. This seyal bhaji looks really yummy. The version that I learnt from my mother was a bit different though. She used to add slitted aloo pieces (as in aloo tukk), bhindi and besan tikkis to the onion tomato gravy. So sorry to hear about you mom Alka; she will be in prayers and hope she recovers and gains her strength soon. What a lovely recipe. I could have bowls full of it, with so many vegetables with so much texture. That drumstick is calling my name. 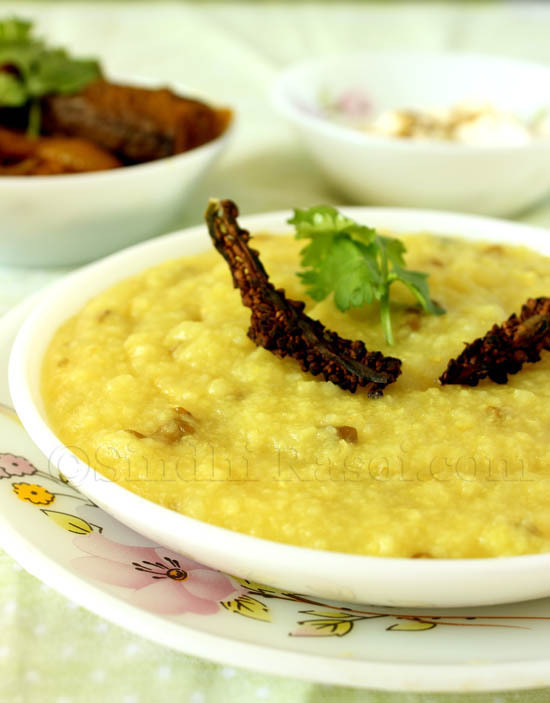 That’s an super yum, aromatic and delicious looking fragrant recipe…nice to see u back…. Mixed vegetable curry looks very tempting Alka. Lovely picture . Sad to know about your mother’s condition, hope she gets better soon. Its heart breaking to see your parents sick. Hope your mom feels better soon. Great to see u back expecting many more posts from you! Curry looks mouth watering! You were missed Alka and good to see you back. Life throws so many curve balls and it can be tiring dodging them all. hope your mom feels better. Warm hugs to you. this bhaji with all the combination is new to me and dlooks good though. Wow what a mouthwatering recipe..sorry to hear that ur mom is ill and she will recover soon..thanks for ur comments..do drop by very often hon and give ur comments..
Hope your mom gets better soon…my prayers are with you and family. Thanks for sharing this simple but mouth watering recipe. Good to see you back Alka. Sad to hear about ur mother’s illness. My prayers for a speedy recovery. Sky-rocketing prices of veggies and pulses are the headlines these days. It sure makes budgeting hard. Bhaji looks delicious. Good choice of a recipe when you have few veggies left to be finished off. Nice to see u back . Hope ur mom gets well soon. The dish is mouthwatering and will definitely try soon this dish . Really ifeel ur recipes r simple and yet innovative and thats why i like ur blog. so keep the grt job going on………. I hope aunty feels better, my regards for her. Thanks for the delicious recipe. Its autumn in the northeast US so this kind of cuisine is favored. I am in NJ right now, and its teeming with Sindhis I am told, haven’t met any yet. Really sorry to hear about your mum’s ill health.My prayers and wishes that she get better soon. I know what it is to have an ailing mother and I am sure things will work out for the best. Well with the price of veggies being what they are. I can just look and drool at your dish and wait for the good times to come in. dish looks absolutely yummy. Seayl Bread…….Is just Yummy Spicy Breakfast. hope your mom gets well soon. Sad to know about your mom’s ill health. I hope she will get well very soon. I too got back from India where I had gone to look after my ailing parents. The Seyal bhaji looks delicious. Will try out after I accumulate all the ingredients. The pics are mouth watering!